It was a regular Friday evening in our family: Our son had just gone to bed and I and my wife were preparing our dinner. We had also heated up the sauna and we were planning to go there within 15 minutes. All of a sudden, we heard a very loud bang and we weren’t sure where the sound came from. At first we thought that the curtain that we had installed earlier that day in our son’s room had fallen down, so we went to his room to check it out. The curtain was still in its place, although it was quite natural that our son had woken up crying because of the loud bang. My wife left to calm down my son while I kept looking for the reason for the bang. Then I opened the door to the shower room (and to the sauna) and I realized what had happened. 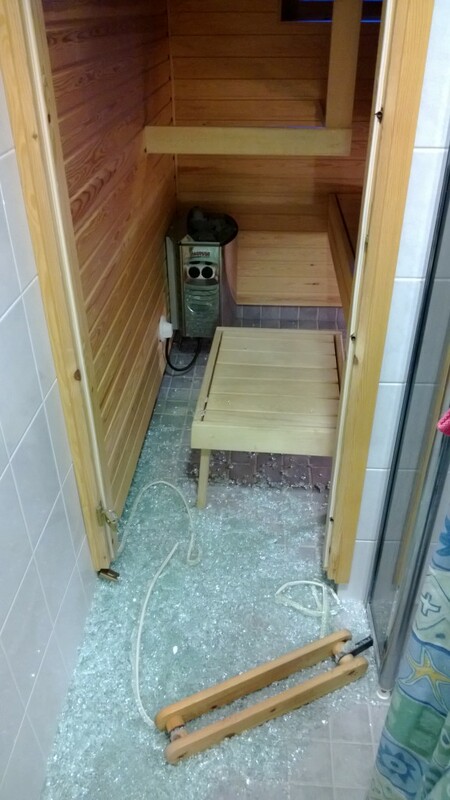 The thick glass door between the actual sauna room and the shower room had literally exploded and now the floor was full of pieces of broken glass. Apparently this had occurred because of excess tension in the door. Fortunately, we weren’t in the sauna during the explosion. I can’t imagine what would have happened to us in that case. Whenever something like this happens, you’ll start to wonder if the insurance will take care of the damage and how much you will have to pay for yourself. Fortunately, all my insurances were in effect and I knew that I had a small portion to pay concerning the damage (my own excess amount); while the insurance company would take care of the rest (they paid for the new door and its installation). However, no matter if someone takes care of the money side of things, there is still some (mundane) paperwork to do and this case wasn’t an exception. Although I could take care of all this online, it still meant there were some tasks that had to be taken care of. There was something I didn’t realize, however: I thought that after notifying the insurance company about the damage, I just had to pay the bill (my excess amount) and I would be ready to take the task off my list. In reality the “paying the bill” task consisted actually of three different tasks. First, I had to pay the insurance company the excess payment of 150 euros. I did this through my online bank. Then, I asked them about some additional information related to the notification form when I informed the insurance company about what had happened. Although one of the insurance agents replied back to me, he also asked me an additional question regarding my insurances. Finally, I also had to contact my personal insurance agent, since this other agent had asked me a question which I wasn’t quite sure how to answer. Plus, I also wanted to talk with my personal agent about the matter. So it wasn’t just this one task (taking care of the excess bill) that I was supposed to do, but three things instead until I could cross the task off my list. And after I realized this, I had this important insight that you are going to learn next. In my case I paid my bill, but when I realized that I still had to send a couple of e-mails before I could finally close the task and get it off my mind, I started to feel internal resistance. Although the bill was paid, those two e-mails were still waiting to be sent and for some reason I didn’t want to do that. Fortunately I managed to use some “brute force” to write and send those e-mails. And as soon as I had done that, I felt good inside and I closed my computer for the day. Actually, I had some other insights during this whole process – especially when I felt like procrastinating when sending those e-mails. First of all, I realized that these tasks I felt like procrastinating on were actually very small ones. All I had to do was to write two e-mails and that would probably take 7 minutes total. Then, I also came to a conclusion that I already had momentum going on and it would be a shame to break it (thus possibly postponing those two little tasks till a later date). I had already started the process by paying the bill, so I could as well get those other two tasks done at once. I also understood that not finishing those small tasks, the Zeigarnik Effect would definitely kick in and I wouldn’t be able to free-up my mind’s capacity for doing something else. 1. Mental preparation. Understand that many times there may be other smaller tasks related to your main task. Be aware of this and plan things out a bit, so you really know all the things you have to take care of. 2. Take the right moment to do the tasks at once. I paid the bill around 9pm in the evening, and then I realized that I had to take care of some additional tasks. Since I wanted to do something else (like watch some television) rather than just sit at my computer all evening, I was ready to give up on the tasks right after paying the bill. The timing wasn’t optimum and that’s why I should have taken care of the tasks earlier in the evening. Just realize this and try to get the task done earlier in the day if possible. 3. Take advantage of momentum. Once I did the initial part of the task (paying the bill), I had already entered the momentum phase. Take advantage of momentum, since it makes taking care of the rest of the tasks (especially the mundane ones) easier. 4. Rinse and repeat. Try to create a habit of finishing the chain of tasks all at once. As soon as you start applying this strategy in your daily life and repeat it enough, you’ll create a positive habit out of it. I never imagined that an exploded sauna door would teach me a lesson about productivity. Over to you: Do you have any tips on how to finish a task at once?